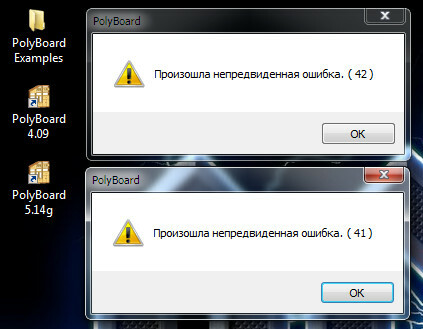 The Polyboard error message (42) indicates an unofficial version of the software has been installed on your computer. The Polyboard error message (41) is caused by a similar non standard install and relates to a damaged protection file within Polyboard. Hello. How can you help my problem? Hello. Windows7 eng, PolyBoard 4.09 demo, PolyBoard 5.14g demo. Programs downloaded from the official site. When I start the program, out the following message: An unexpected error occurred (41 or 42). What does this mean and what can I do that would be to try the program? I’m not sure what this error message means. Can you send us some more information? what versions of Polyboard are installed on your computer and if these versions have been activated officially or unofficially. Всем привет. Я из Украины. 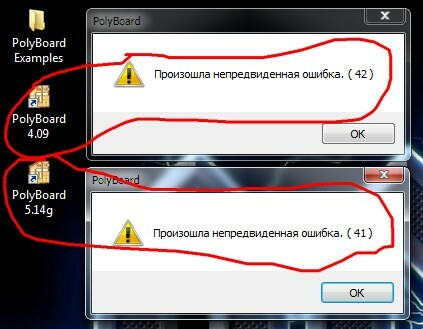 Скачал демо версию программы Polyboard. Когда я запускаю программу, то появляется “Произошла непредвиденная ошибка”. Что мне делать? Спасибо. Hello. I’m from Ukraine. Download the demo version of the program Polyboard. When I run the program, it appears, “An unexpected error occurred.” What should I do? Thank you.